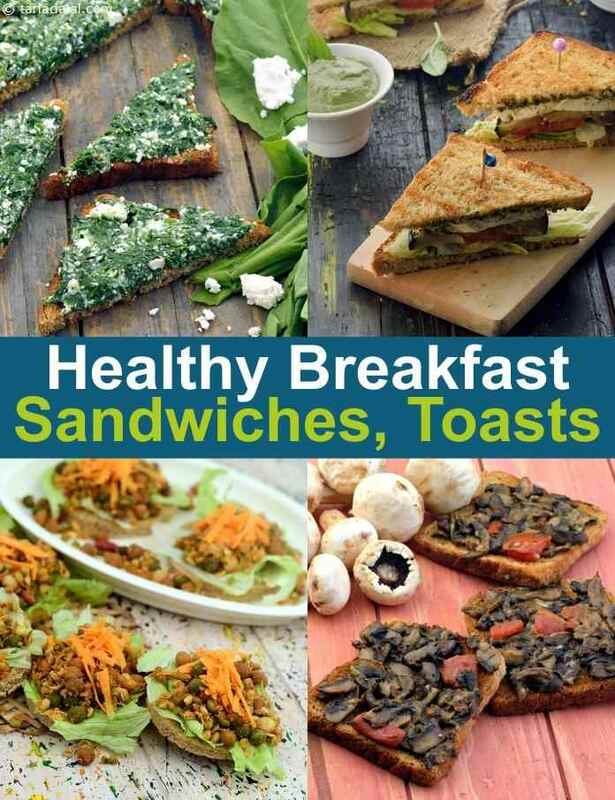 Enter, to discover a mighty handful of super-satisfying sandwiches to kick off your day with some healthy breakfast! Handy and portable, hearty and healthy, sandwiches can be made just the way you want it, from elaborate sandwiches on a relaxed day to quick stuff on a busy morning. From sandwiches to sit and chat with, to those that you can have on-the-go, there are umpteen options that you can choose from, and endless ideas you can tap to create your own personalised sandwiches. Paneer is healthy and contains good fat. You can use both low fat paneer and full fat paneer. We have the Spicy Paneer on Toast and Carrot and Paneer Toast. Sprouts are high in Fibre and very low cal food. Try Mixed Sprouts on Toast or Spicy Sprouts Sandwich. Whats worth noting that Ketchup consists 50% sugar and its better to use Tobasco or Mustard. White Bread is made of refined flour which will push up your insulin levels and shut down your fat burning. Make your own low fat Mayonaise at home and avoid store bought processed Mayonaisse. Potatoes to be avoided as comsumption of that will make you look like a potatoe. Pep up multigrain bread with a tangy tomato spread and a healthy topping of spinach and sprouts. Kids will definitely love this colourful vitamin-rich treat, while adults will relish the low cholesterol start to the day! Loads of fibre and vitamin-rich veggies and low-fat butter go into these sandwiches with a difference. Low in calories, the whole wheat rolls are apt for weight watchers, diabetics and people with heart disease. Paneer Open Toast, a zesty topping comprised of low-fat paneer and vegetables adds spice to nutritious whole wheat toasts. A great teatime snack providing nearly 116 calories per toast, these are best accompaniment by a hot, sugar-free beverage! Oats is not just for porridge! why not make a delicious and nutritious toast by combining oats and moong with lots of perky coriander? Make sure you make these just before serving, to prevent them from turning soggy.